We had lunch at Wikiwiki Hawaiian BBQ which just opened today. It replaced this rotisserie chicken place but the decor didn’t change much. I mean, they repainted and hung some cool Hawaiian stick figure theme lights but it didn’t do enough to alleviate the cafeteria feel of the space. Anyhows, the menu has stuff like loco moco, kalua pork, pork lau lau, chicken katsu, beef curry, mahi mahi, bbq short ribs, and musubi, etcetc. A lot of Hawaiian stuff:) Since it was our first time, we decided to try the loco moco and the kalua pork & pork lau lau plates. The kalua pork was actually pretty yummy, nice and tender. The laulau was a disappointment though. Even though the taro leaf package looks pretty big, there’s actually not that much stuff inside. Also, I’m not sure if they just didn’t properly steam it or what, but the pork inside was tough and dry. Oh well. keeheehee. 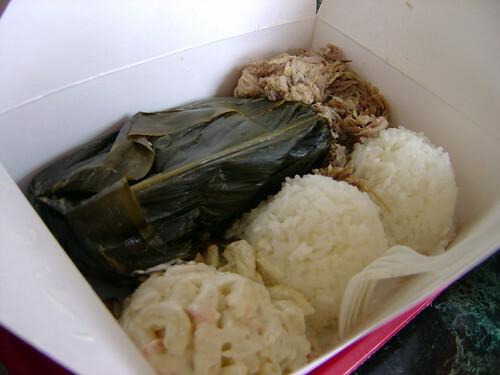 never had hawaiian food b4 buh looks good i guess=) mmm… yay! i guessed at least one of the shoes right. oh well i still would’ve gone for the tims though. I’m all over this place!!! time to get myself fat! 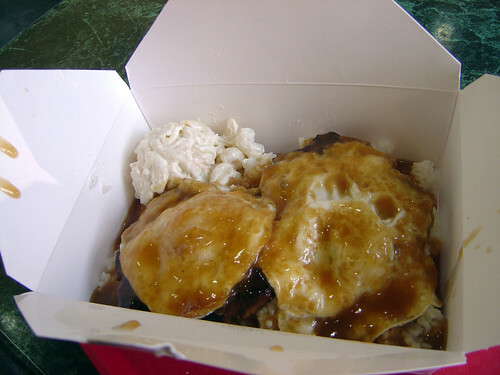 Even if the pork lau lau isn’t great I’ll still be hitting it up for the loco moco at least. I went to the L&L out in Hayward and it still wasn’t as good as the one in Hawaii, weird.